Education: Miss Akintade attended Joy International College Kaduna State for her secondary education from 1993-1999 where she sat for her West African School Examination. She proceeded to theAdekunle Ajasin University Akungba Akoko, Ondo State,Ilorin, Kwara State, from 2006-2011 where he obtained his LL.B (HONS), Common Law (2nd Class, Lower Division). Background: Miss Akintade was admitted to the Nigerian Bar as a Solicitor and Advocate of the Supreme Court of Nigeria in 2009 having satisfied the requirements to be so admitted. 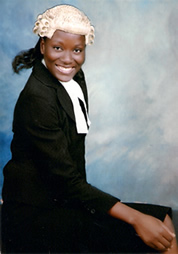 She did her National Youth Service Scheme with the law firm of Yusuf O. Ali & co. from August 2009 – June 2010 where she was exposed to core litigation and advocacy skills. She joined the law firm of Yusuf Ali & Co. in July, 2010 as a junior counsel, immediately after the completion of her National Youth Service Scheme with the Firm. Miss Akintade has in the course of her career so far had experience in the representation of corporate and individual clients in all the courts of record in Nigeria. Though exposed to all aspects of legal practice, she has keen interest in Election Petitions, Commercial Law, Corporate Law Practice, Criminal Prosecution, Administrative Law and Property Law. Practice Area: Litigations, Corporate and Commercial Practices, Election and Electoral matters, Real Estate, Intellectual Property, Taxation and Telecommunication.